MxPx has debuted a new music video for the second week in a row. “Rolling Strong” is from their self-titled album and emphasizes the importance of doing what makes you happy. The music video was released a week ahead of their music video for “Let’s Ride”. Both videos stress the power of a long friendship and the power in growing old and staying with the same group of friends (MxPx has been together since 1992)! The band uses Power Slinkys and Bass Regular Slinkys. MxPx bassist, Mike Herrera, plays with a Music Man StingRay. Thrice have dropped a new music video in wake of their upcoming album, Palms. The song from the video is titled “The Grey”. Thrice have confirmed that the song will be included in the upcoming 10th studio album, due out on September 14th. See a show while they are still on their monstrous North American Tour! Thrice prefers to play with Beefy Slinky, Not Even Slinky guitar and Power Slinky Bass strings. Check out Thrice frontman Dustin Kensrue’s exclusive Ernie Ball episode of String Theory. Sleeping with Sirens debuted a track that features The Rocket Summer on July 6th. The new single is called “Another Day” and has a beautiful acoustic feel. Full of emotion and angst, the song is an excellent prep for their Chill Out Summer Acoustic Tour. Sleeping with Sirens is currently heading up the East Coast and you can follow along via their Instagram account to stay updated on their whereabouts. Sleeping with Sirens uses Power Slinkys and Cobalt Bass Power Slinkys. Prophets of Rage released a new song titled “Heart Afire” on July 6th. Guitarist Tom Morello threw in tons of classic guitar riffs throughout the rock ballad. The group also stated that they have finished an album that is due out in September. The track is available on all major streaming services and there’s a Youtube clip below for your immediate satisfaction. Prophets of Rage play Power Slinkys and Bass Hybrid Slinkys. Good Charlotte is heading out on a huge North American Tour to promote their seventh studio album, Generation Rx. The album is due out on September 14th. The tour will start in Mexico City on the 12th of October and will finish in November. The group also plans an international tour that will start in February of 2019. So far, the only taste of the new album we have is a music video for the song “Actual Pain.” Check out the video below. Good Charlotte play Skinny Top Heavy Bottom Sinkys and Bass 5 Regular Slinkys. 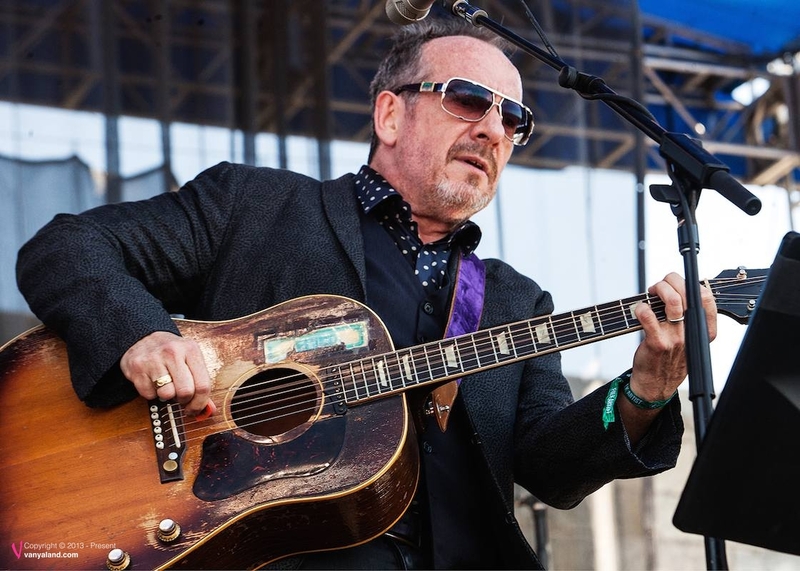 Elvis Costello and the Imposters, unfortunately, have to cancel the remaining six shows on their European Tour. The cancellation is due to health related issues. Dates that will be missed include July 6 in Manchester, July 8 in Croatia, July 9 and 11 in Austria, July 14 in Norway, and July 16 in Sweden. While the surgery is not a good thing, the future looks good for the band as Elvis stated that after his recovery time, they will be back on tour within the United States promoting a new album! All of us here at Ernie Ball wish Elvis a speedy recovery. Elvis Costello plays with Skinny Top Heavy Bottom Slinkys, Beefy Slinkys, and Earthwood Phosphor Bronze Medium Acoustic Strings. The Wonder Years announced in a Facebook post that they will be playing a string of shows around Riot Fest this Fall. You can grab tickets on their website to attend one of their four shows. The group will undoubtedly be playing songs from their February of 2018 released album Sister Cities. Watch the Official Music Video for the album’s title track to entice your interest. The Wonder Years prefer to use Beefy Slinkys, Bass Power Slinkys, and Earthwood 80/20 Medium Lights. 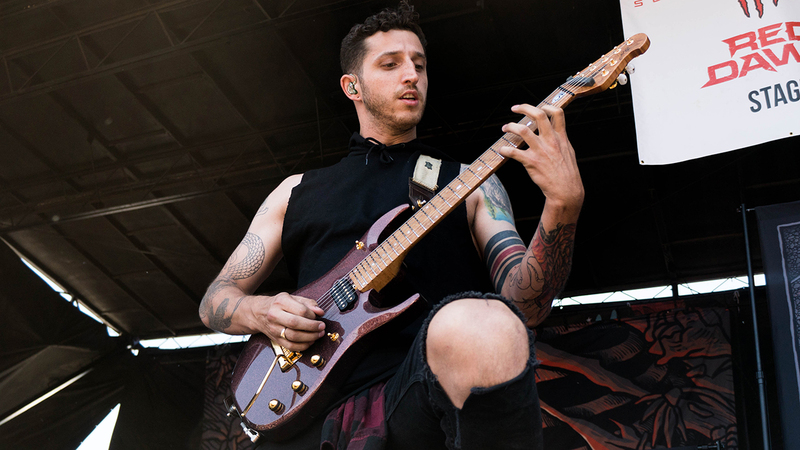 At Warped Tour Salt Lake City, we caught up with Stephen of Chelsea Grin for an exclusive Q&A. EB: Do you remember your first Music Man/ When you got it? Stephen Rutishauser: “I discovered Music Man a while ago just seeing some of my favorite artists play it. 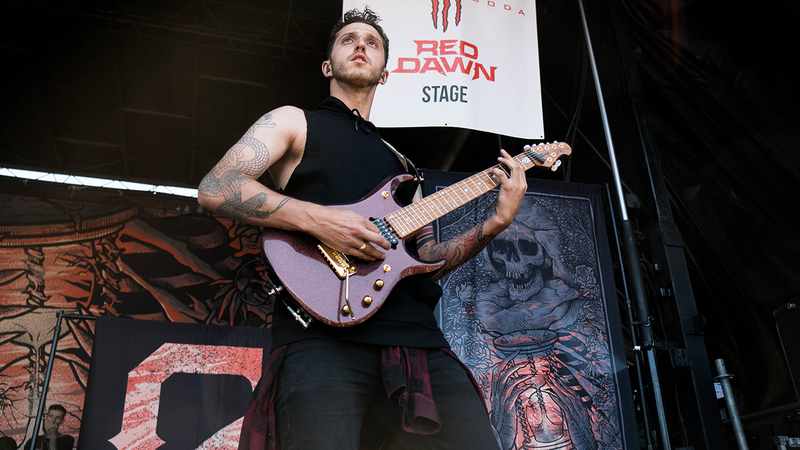 Then, I had an opportunity to work for Chelsea Grin as their Guitar Tech for a while, and I quickly realized there is no better-built guitar, no better sounding guitar, and they can withstand touring like none other. Basically working on them, I realized how much I loved them! EB: What is guitar playing to you and what inspires you to write songs? EB: Can you take us through a few different guitars you are using on this tour? Stephen Rutishauser: “Sure! This is my first JP13 Music Man Guitar. I have it in the gold finish, it’s one of my oldest guitars. Thing is a total tank and I love it! I’ve never had to set it up since I got it the first time, which is insane. I also just got this new JP13 for Warped Tour. It has the JP15 neck on it so it’s roasted birdseye maple along with a standard JP13 body. I got this one in a Root Beer finish and it’s my favorite one so far. The fastest, nastiest neck I’ve ever touched. I can’t help but riff on it!